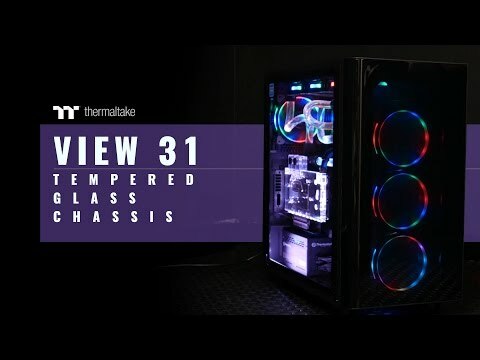 The View 31 TG Tempered Glass Mid-Tower Chassis features dual durable 4mm thick tempered glass window, riser GPU support bracket with optional PCI-e riser cable, two preinstalled 140mm Riing Blue fans with removable filters, and outstanding system ventilation. The View 31 TG supports the latest PC hardware and all high-end GPU solutions, guarantees on unparalleled expandability for high-end configurations and liquid cooling system to satisfy the market where users have opted for stylish PC chassis with advanced features and aesthetic appeal. Specially designed with dual GPU placement, the View 31 TG has the support for vertical graphic card layout with dual PCI-E slots design. The PCI-e riser cable is optional. Plus, the included riser GPU support bracket not only can prevent the graphic card from sagging, but also helps to reduce the weight on the motherboard. The View 31 TG features its cable management with maximum 50mm in width, and supports up to a tower CPU cooler with maximum height 180mm, and a dual expansion slot VGA of up to 420mm in length without HDD rack. Moreover, the View 31 TG has the ability to accommodate multiple 3.5”/2.5” storage devices at the same time. Most importantly, the hidden drive bay design guarantees expandability for more liquid cooling components. The View 31 TG Series delivers advanced cooling performance for DIY/AIO liquid cooling and air cooling systems. With wide top-to-bottom side ventilation grills, the View 31 TG maximizes the air intake with two built-in 140mm Riing Blue LED fans. It includes options for up to (3) 120mm or 140mm front fans, combined with (2) bottom mount 120mm fan locations for maximum fan space selection. Dissipate heat properly with (1) rear built-in 140mm fan and (3) sectional top mounts to manage proper air flow in and out. 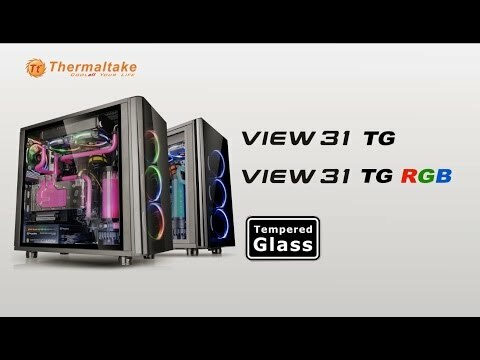 Thermaltake View 31 Tempered Glass Mid Tower Case, Fully Modular Concept, Riser GPU Support bracket, 2x Blue Riing Fans is rated 5.0 out of 5 by 3. Rated 5 out of 5 by Ady8 from great piece of kit Bought this to put together a spare system. Well made for the money and the tempered glass is a nice touch. As I have an old core X31 kicking about a lot of parts are interchangeable too (psu shroud for example). The only thing is the acrylic front panel. I'd pay extra for it to be glass too but that's just a minor gripe. First class service from Scan as usual, enough said. Rated 5 out of 5 by SeanPereira from Wow wow wow!!! Custom watercoolers dream Well I always seem to make the same silly mistake of reviewing 2 or 3 cases and then buying the wrong one, it was between this case, game max onyx, and corsair 460x, I got the game max first, silly mistake, should of got this one, the only reason I didn't originally buy this one is lack of Psu shroud, doesn't matter, you can't really see the cables anyway, cable management is a breeze, support for large Psu, 2 x 360mm radiators, with push pull on at least one of them, and it's tempered glass at a great price, love the fact the graphics card can also be mounted on its side so is viewable through the window, just a shame it doesn't come with the cable for it, and the fact the cable is an extra £30, I'm not sure if I'll bother. My watercooling is currently leak testing hence all the kitchen towel in the case, but you'll get the idea. My system specs now are an msi b350m mortar am4 motherboard, running with an R7 1700 at 3.9ghz, 16gb G. SKILL trident z rgb 3200mhz cl16 running at 3200mhz, thermaltake view 31 case, with thermaltake riing 12 rgb fans, superflower 1kw fully modular Psu, sapphire RX480 nitro+ graphics card, custom watercooling, more to come though. 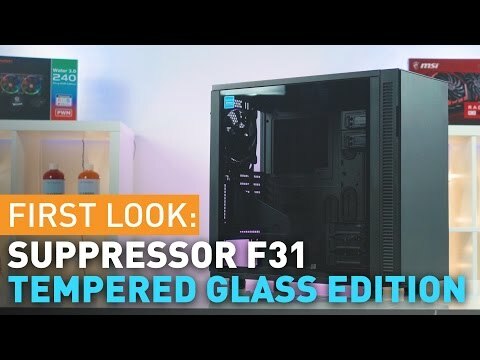 Ordered this on Wednesday with some thermaltake riing rgb fans for delivery on Thursday, not quite sure what went wrong, although they were despatched together only the fans arrived on thursday, I was panicking that the case got lost, the courier was absolutely no help, scan customer services were excellent, I even called Dpd and arranged to collect the case from there depot instead, which they said was fine, turned up and they couldn't find it, once again, it didn't get loaded onto a van on the Friday either, after contacting scan again, I got a message saying it was on the way, one of the Dpd supervisors came out in his own car with it to deliver to me. Phew. Once again, this is all thanks to scan customers services, thank you very much, Dpd in this case we're pretty useless.